Commercial foundations, similar to residential foundations, vary greatly based on soil conditions and budget, but the main aspect that sets commercial foundations apart from residential foundations is estimated load capacity. 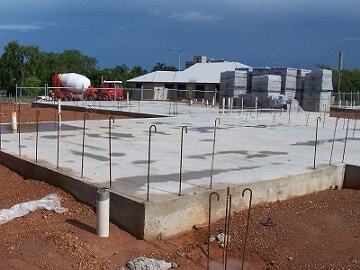 A commercial building’s foundation is the most important portion of the structure. It is the basis for the stability and security of the building. Matthews Wall Anchor’s professionals, including civil engineers and structural contractors, have the answer for you. There are only a few different types of commercial foundations, but Matthews Wall Anchor has the people and equipment to handle anything you may have. In order to support a deep foundation, piles are used. Some commercial foundation plans call for single piles to be installed, while others call for multiple piles based on structural load. Piles are most commonly concrete, but can also be made from steel or wood. Pile caps can receive columns or grade beams for added support. Continuous or spot footing generally carry columns and/or grade beams. With a wider than normal footing, the structural load is distributed into the soil surrounding the building’s foundation. This commercial foundation type is also referred to as a shallow foundation and is commonly used in commercial construction. Mat foundations are typically thicker and more reinforced than other “heavy” load foundation types. Mat foundations are thick, soil-rock supported foundations that maintain the same thickness all the way through. This type of commercial foundation can be made to be shallow or deep depending on construction conditions and specifications. This type of commercial foundation is a shallow foundation that is used on buildings to support lightly loaded foundations. Using grade beams, perimeter forms, reinforcements, and castings; the grade beams and floor slabs come together in one pour. Monolithic slab with grade beams foundation is designed to support walls that are carrying a uniformed load versus support column loads. A spread footing is a base for a foundation with a wider bottom. This allows the structure’s weight to cover a large area. Spread footings are usually made of rebar and concrete. They have a lower risk of foundation failure and varies in size. They are designed to prevent sinking foundations, frost heaving, and other settlement issues. Call us today at Matthews Wall Anchor so we can assist you with all of your commercial foundation needs in Pittsburgh, PA and the surrounding area.